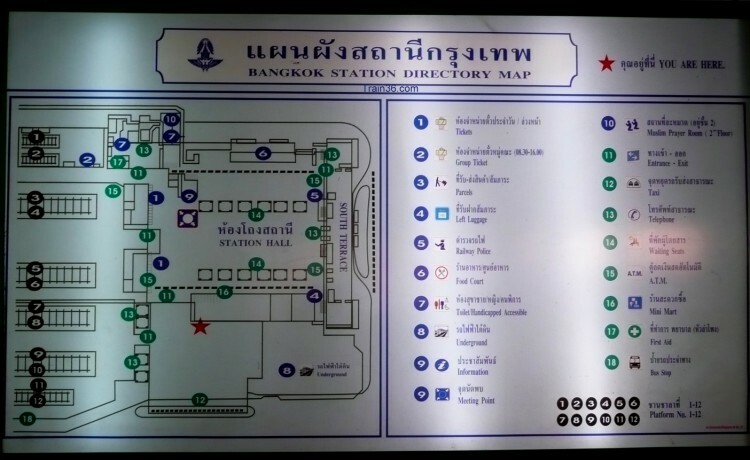 On this page you can find all there is to know about the main Bangkok Train Station, Hua Lamphong Railway Station, with all you need to know about Ticketing, Train Schedules, Maps, How to get to Hua Lamphong Station, General Information, Internet WIFI, Food, Left Luggage, Money Exchange and ATM's. 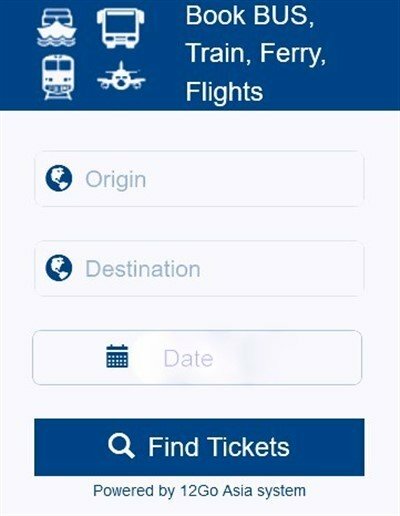 Looking for trains times and fares from Bangkok? The main train station in Bangkok is named Hua Lamphong สถานีรถไฟหัวลำโพง. It is located in Pathum Wan district near the vibrant and chaotic China Town. It has 12 platforms and it is the starting point to explore by train, Northern Thailand, North-Eastern Thailand, Southern Thailand as well as Eastern Thailand. You can purchase Bangkok train tickets up to 60 days before your departure date. It is possible that you will be asked to show your passport or ID card at the time of purchase / postponement / cancellation of your train ticket. In that case your name and your passport / ID card number will be written on your ticket. 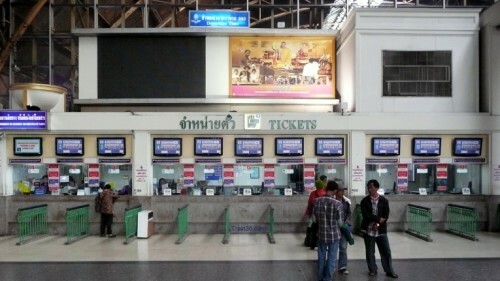 At the Bangkok Train Station there are a total of 22 Ticket counters. Ticket counters numbered 2 to 11 and 15 to 20 sell tickets for all trains as mentioned on the screens above the counters. Advanced bookings can be made at these counters. Ticket counters 12 to 14 sell only Commuter tickets. Ticket counters 21 and 22 used to sell Advanced Booking tickets, but are nowadays closed. Take a trip from Bangkok to the Train Market at Mae Klong. Do it yourself by local commuter train or take an organised tour. Type of trains: ordinary train, rapid train, express train, special express train, sprinter train (DRC), commuter train. The type of classes: First Class / Second Class / Third Class. Seat or berth (lower or upper sleeping berth / bed). Fan cooled or air-conditioned carriage. Postponement of travel, cancellation and refund of ticket can be made at the ticket counter number 1.
for tickets on seater trains, the fee is 20THB (Fan) 50THB (A/C). for tickets on sleeper trains, the fee is 50THB. Cancellation and refund of a train ticket made 3 days before the departure = lose 20% of the ticket price. Cancellation and refund of a train ticket made less than 3 days up to one hour before the departure = lose 50% of the ticket price. Refund of a ticket less than one hour before the departure or after the departure is not possible. N.B. Please bring your passport or ID card when changing date of travel or cancelling a train ticket. For those with travelling with Parcels or Cargo (such a bicycles), the area for picking up or sending parcels is located besides the Platform number 12 (besides the Check-in counter for the famous Eastern and Oriental Express). There are three Information Counters at the train station. The main Information counter is located inside the main hall. 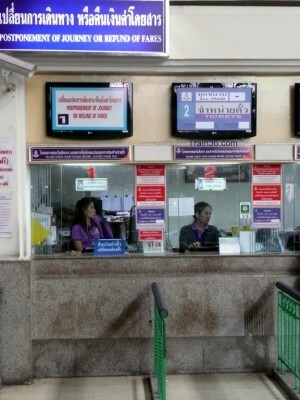 From this counter you will be able to ask any questions regarding train fares and connections as well as pick up timetables for all Thai railway routes. There is another one right outside the entrance / exit close to the subway entrance. The last Information counter is located at the start of the platform number 5 and comes in handy for finding out which platform your train is leaving from. If you need help, use one of these official information counters or the tickets counters. Unfortunately, there are plenty of touts and con-artists that hang around the station and may come up to you offering assistance. The favourite one is to tell you that the train you want to travel on is full, but lucky for you there is a luxury bus (the ticket tout is selling) that you can take leaving soon to the very same destination. Do not believe them - check with the ticket desk yourself! The Bangkok Train Station offers a wide range of services and is a pleasant enough place for a few hours. If you are waiting for a connecting train and have a few hours to explore the city, you don't have to carry your bags with you as there is a Left-luggage office which charges 60THB for small bag and 80THB for big bag. It is open from 4 am to 11 pm and it is located on the left corner when entering the station from the main gate. You can refresh yourself by taking a shower for 20THB which is located opposite the Toilets (2THB) on the right side of the Ticket counter 22 behind the Information desk. The Station does not have a WIFI Connection but it has an Internet Shop which charges a rather expensive 20THB for 5 minutes, printing documents is also available. The shop is located on one of the mezzanines near the Left-luggage office. Food and Drink at Hua Lamphong Station : There is a Food-court (around 40 - 60THB) as well as many restaurants such as KFC (Western Food), Anna Kitchen (Thai food a bit pricier than the Food court) or Coffee Shops such as Black Canyon Coffee. There are also bakery shops and a Dunkin Donuts shop. If you need to buy supplies for your train journey, there is a grocery shop named Tiffy Mart with a Pharmacy counter close to Ticket Counter 1 and the entrance / exit for the Subway number 2. There are ATM's from different Thai Banks: Siam Commercial Bank, Bangkok Bank and Krungthai Bank. There is also a Foreign Exchange Booth from the Bangkok Bank. 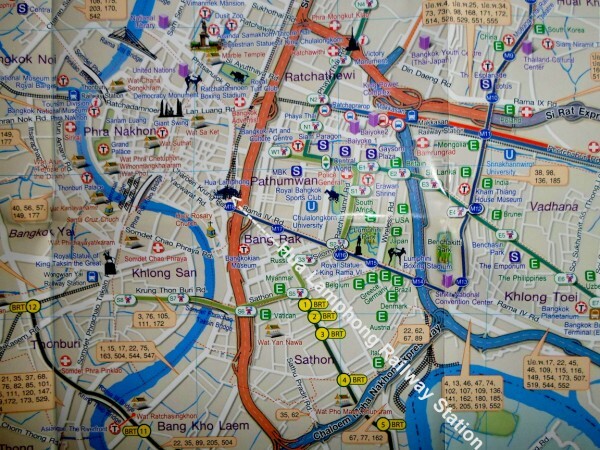 Where to stay near Hua Lamphong Railway Station? This area of Bangkok has a number of accommodation options for all budgets and most hotels can be reached by a fairly short walk. Hua Lamphong is not the only train station in Bangkok Thailand and you may find it easier to travel to one of the other stations in the city, depending on where you are staying. Bang Sue Junction Railway station is a good alternative to Hua Lamphong, with nearly all trains to the South, North and North-East stopping here. It is also fairly close to Mo Chit Northern Bus Terminal. Samsen station lies between Hua Lamphong and Bang Sue. Makkasan Rail Link station is one of the major stops on the Airport Rail Link to BKK airport. Ratchaprarop Station on the Airport City Line. Thon Buri Railway station is located on the West side of the Chaopraya river and has services to Kanchanaburi and to the beach resorts to the South of Bangkok on the Gulf of Thailand, like Hua Hin. Wongwian Yai and Talat Phlu stations are on the short Mae Khlong railway line with trains to Maha Chai, then onto the famous Mae Klong Train Market.